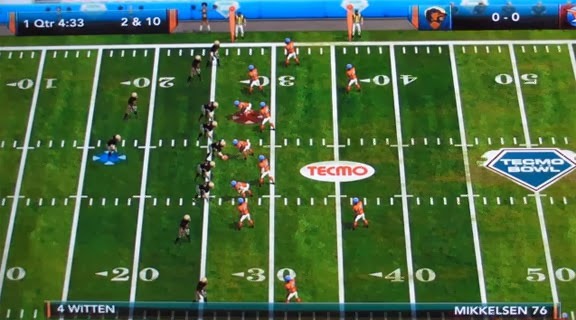 Playing it Wrong: Tecmo Bowl Throwback: Throws Two Thumbs Up! Tecmo Bowl Throwback: Throws Two Thumbs Up! Tecmo Bowl Throwback is exactly as its titled, a new version mimicking the famous Tecmo Nintendo Game although sans the NFL/NFLPA licenses. The game features updated clean graphics and art, Season Play, and the ability to switch back and fourth between 3d and 2d for all those nostalgia lovers. I love that even though the teams aren't NFL standardized that the cities are correct which makes the editing tool actually useful, allowing you to edit player names to be as close to the official NFL rosters as possible. 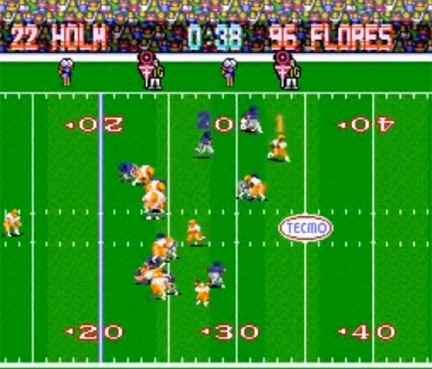 Tecmo also did a fantastic job with creating unique, custom jerseys for each team, however the logo's are a bit lackadaisical. The main reason why this game "works" is the fact that it does exactly what the title says, it is in fact a new version of the original game we all grew up loving. Items as blatantly obvious as the play calling all the way to the very faint hints of how the quarterback calls the "hut" "hut" "hut" cadence over and over while under center. The only thing that the game really lacks is replay value, even with a "season mode" you are still picking 1 of 8 plays and zig-zagging up and down the field. All in all the game is a great $10 purchase. There is just enough added to this game to allow a new age gamer to go along for the ride as well as just enough kept the same to keep the old school nostalgia seeker fascinated for a while.